Dailybuzz.ch: Kim Kardashian And Kanye West Enjoy Date Night At GQ Awards In London: See The Cute PDA Photos! Kim Kardashian And Kanye West Enjoy Date Night At GQ Awards In London: See The Cute PDA Photos! At tonight's GQ Men of the Year awards in London, the red carpet was all about Kim Kardashian and Kanye West's adorable PDA! The cute couple were all smiles during their date night Tuesday at the Royal Opera House. The 33-year-old Keeping Up With the Kardashians star looked super hot while showing off major cleavage in a structured bodysuit under a see-through silver skirt (if the bra top looks familiar, it's the same style as the dress Kim wore to the Made in America concert this weekend!). Meanwhile, the 37-year-old rapper looked handsome in tight black dress pants and a navy coat. The lovebirds posed for pics together and engaged in some PDA while hugging and kissing in front of the cameras. Kanye was even caught giving his wife a smooch on the shoulder. Too cute! laughed and chatted with pals. Firth, Jonah Hill and Sam Smith. 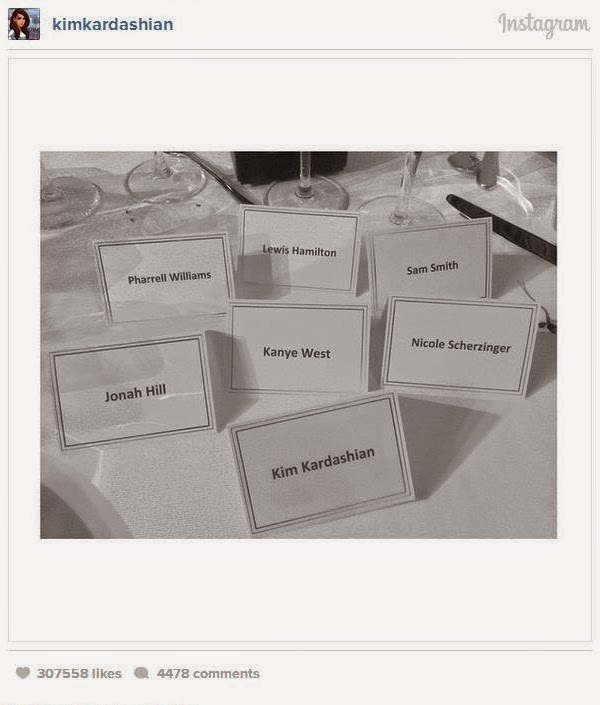 Kim shared a cute photo of her dinner table with the place cards of celebs at her table, including Smith, Scherzinger, Williams and Hill.